Hope you’re all ready for today, cause we’re in for a treat! I’m sure you’re all familiar with this week’s guest, but in case you aren’t I’d like to introduce Luke Murphey, author of Dead man’s Hand. What’s so special about today, you ask? I’m glad you asked. Pain bolted through his swollen right knee, but the emotional pain from a shattered ego hurt even worse. It was the same pain and nightmare that had visited him many nights over the last four years. He was the only one to blame for USC’s humiliating loss and his own humiliating personal downfall. Removing the sweat-soaked sheets, he hobbled across the room, dodged the strewn clothes on the floor, stepped into the bathroom and quietly closed the door behind him. He flicked on the light and squinted as the sudden brightness blinded him. Then he reached for the bottle of Percocet, his loyal companion in these isolated, agonizing nights. He shook three of the blue painkillers into his hand, his steady diet of Percs. When he couldn’t get enough from his doctor, he bought extras from a dealer. He downed the pills, chasing them with a mouthful of water. They would take some time to kick in, but relief was on its way. The drugs, along with his secret hopes and plans, were all that kept him from slipping over the edge. The patchy facial hair was Calvin’s decision. The overall effect was menacing—just right for his line of work. 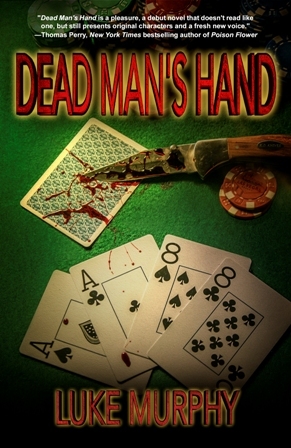 This entry was posted in book excerpt and tagged book excerpt, crime, Dead Man's Hand, Luke Murphy, mystery. Bookmark the permalink.